The Fair For Life team will be present at Biofach 2019 from February 13 to 16th. We cordially invite you to join our fair trade breakfast get-together! 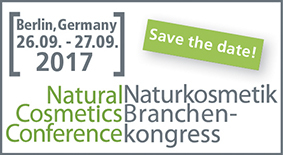 The 10th edition of the Natural Cosmetics Conference is coming up very soon with exiting and trend- topics around the natural and organic cosmetics segment. The Conference offers an international platform for networking and discussion. This year, topics like the practice of fair trade in raw materials and added value in countries of origin will be discussed. Fair For Life acts as conference partner once again.